Film noir and melodrama collide in Otto Preminger's tale of the shoplifting wife of a psychoanalyst, who finds herself drawn into in a web of blackmail and murder. In this intriguing blend of film noir and women's picture, Gene Tierney, the star of Laura, Otto Preminger's first big success, is Ann Sutton, the well-dressed wife of a successful psychoanalyst, played with chilling remoteness by Richard Conte. When arrested for shoplifting, she is saved from inevitable scandal by the intervention of the suave but slightly sinister hypnotist David Korvo (Jose Ferrer). However, the salvation proves deceptive and she soon finds herself caught up in a web of blackmail and murder. 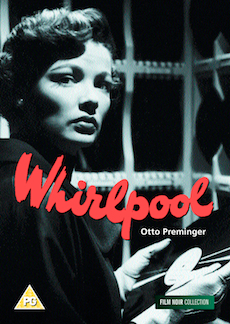 Although Whirlpool has all the themes of a traditional noir, the story takes place in a world of glossy interiors, luxurious decor and expensive clothes, sumptuously photographed by Arthur Miller. Scripted by one of Hollywood's most acclaimed screenwriters, Ben Hecht, from the novel Methinks the Lady... by Guy Endore, Preminger turns the story into an examination of people – and a marriage – under stress. Ann's husband is cold and distant and much as she would like to talk to him about his work, he patronisingly tells her to stay "just as you are". Korvo realises that her stealing is a symptom of mental illness, which he schemes to exploit. As she is sucked into the hypnotist's plot, the nature of Ann's illness is gradually revealed. When Korvo's trap is sprung and she is accused of murder, she turns on her husband in a shocking outburst, saying that she has never been happy with him, and that she has always been a thief. The falsity of the conventional ending does little to dispel Preminger's bleak vision of marriage. It cannot cover up the cracks that the film has revealed beneath the glossy surface of the Sutton's bourgeois marriage. Biography of screenwriter Ben Hecht.